The splash of rhetorics and melodrama is to the uninitiated, quite overpowering. But then who in India is not aware of the bombastic antics of Rajnikanth the actor who defies gravity? This is a man whom no force can defeat. Not poverty. Not pomposity. Kaala twins it with majestic grandeur over poverty and pomposity. Aspiring to penetrate the squalor of slum life in Mumbai’s Dharavi, this film ends up being the poor man’s Slumdog Millionaire. Stuffed to the gills with epic ambitions, the plot bursts open at the seams under the weight of its self-importance. Then there is the hamming. Enough of it to invest in a pork factory. So much of it from so many characters who most of the time hang around waiting to say things that they feel will change the world. I thought I was watching a Mani Ratnam film being directed by Ram Gopal Varma. Indeed there is more than a dollop of Ratnam’s Nayakan and Dalapathi in Kaala. Dalapathi in the way family values are encircled and enshrined in the rites of violence. There are men in lungis and dhotis running in every direction shouting bloody murder. And it’s all supposed to be fine and even moral because the fight is for their land. Indeed in this mayhem-motivated mess of a movie about the tussle between the landlord and landless no guns are visible except the weak, morally deranged cop (Pankaj Tripathi in one of his worst roles in recent times) who is overpowered by the mob after he uses his gun. For the rest, it is swords, sickles and heavy iron objects all the way. But that loud thud is not just primitive weapons bashing brains and skulls. It also the sound of a film fumbling and falling as it attempts to create a raga of revolution through its cacophony of mayhem. While characters go as per the plot’s convenience no one is counting the chickens even after they hatch. Rajinikanth’s brood of followers, family, friends and well-wishers is so wide in this film, you feel he’s indeed ready for the popular mandate. Except for the fact that his political ideology here is nothing more than a migrant’s lament. Nana Patekar as Rajinikanth’s adversary gets no attention from the script in the first-half. We see just the back of his head and shot of his legs before interval. In the second-half Patekar tries to match wits with Rajinikanth and fails. Not only because ….well, if you cross swords with the Thalaiva you are bound to fall. But then the dialogues don’t make it any easier for Patekar. “Sweet girl,” Rajni remarks in reciprocation. Flattery pumps up the film’s protagonist to a demi-god status. But there is little momentum in Rajnikanth’s slummed majesty. His relationship with his simple, bucolic wife (Eswari Rao, behaving as though a fling with cerebral palsy left her shaken for life) strains at the leash. Rajini he also has the hots for a woman called Zareen (Huma Qureshi) who we are told is an activist who won’t take a no for an answer. She sometimes laces her dialogues in English to let us know she has travelled the world. 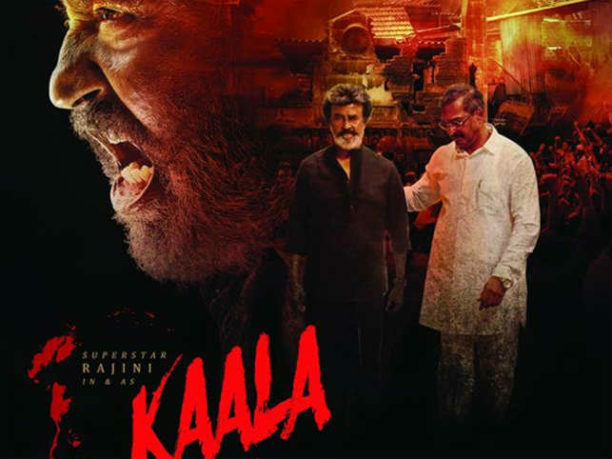 Kaala give us no choice but to be impressed by its propensity towards grandeur. It mows through our apprehensions conveying the urgency of a pre-fixed wrestling match. The bleeding heart for slumdwellers in Kaala could have done with some temperance, restrain and self-discipline. Not the traits we can find easily in a Rajnikanth starrer. Don’t say you were not warned.